The colors and textures of fabric and yarns have fascinated me since I was a small child watching my mother sew. 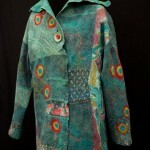 I have been sewing and working with fiber in one form or another for most of my life. After a 25 year career in consumer product manufacturing, I left the corporate world to pursue more creative interests. 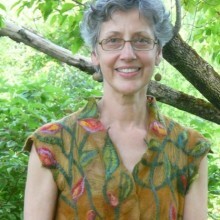 Over the years, I’ve made many garments, quilts (both traditional and art quilts), learned to knit and stumbled into felting after a friend convinced me to take a workshop. More recently, my passions are knitting (colorwork, in particular!) and felting. I am also an avid dyer and dye my own wools and many of the silk fabrics I use in the garments I make.